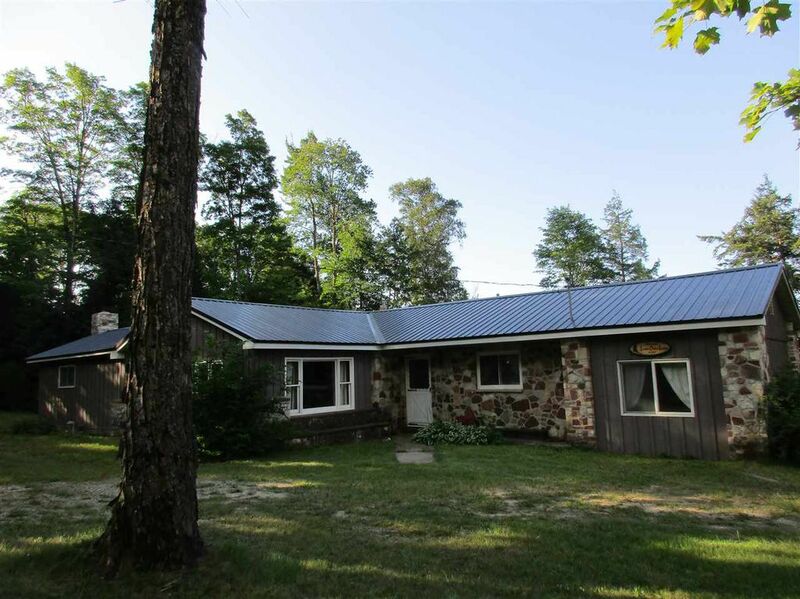 Stone House is a pleasant, ranch-style home in McMillan, Michigan, just off MI-28. 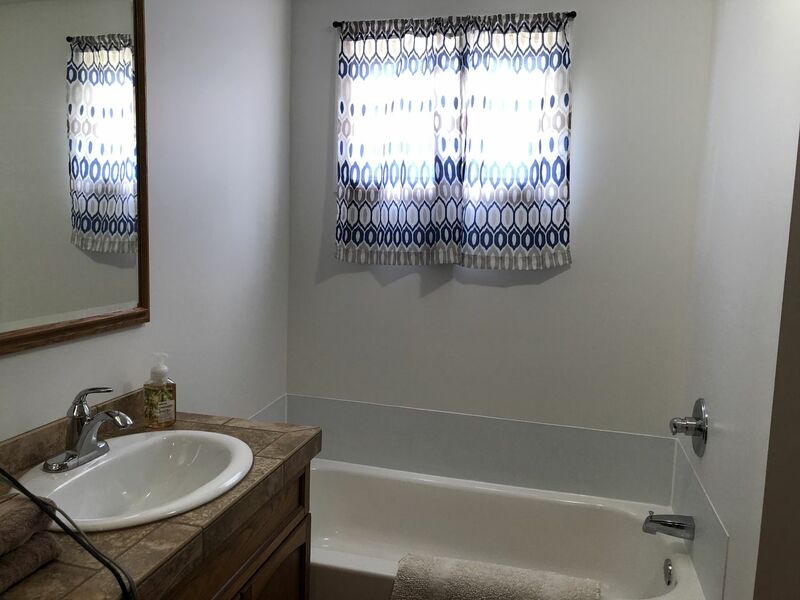 Hosting 4 bedrooms and 2 bathrooms; this home has new furniture and new flooring in living room and bedrooms. Stone House sits on a large plot of land with a fire pit for guests to enjoy (however, in the winter the fire pit might be covered in snow). You will appreciate a fully-equipped kitchen with dishwasher and a master bedroom with a California King bed with a wide view of the water. The dining room area seats 6 people around the table and come with 2 breakfast bar stools as well to accommodate guests. What is nice about Stone House is that the bedrooms are split by the kitchen, making privacy a bit more achievable. Perhaps sharing with another family of 4 is an option. 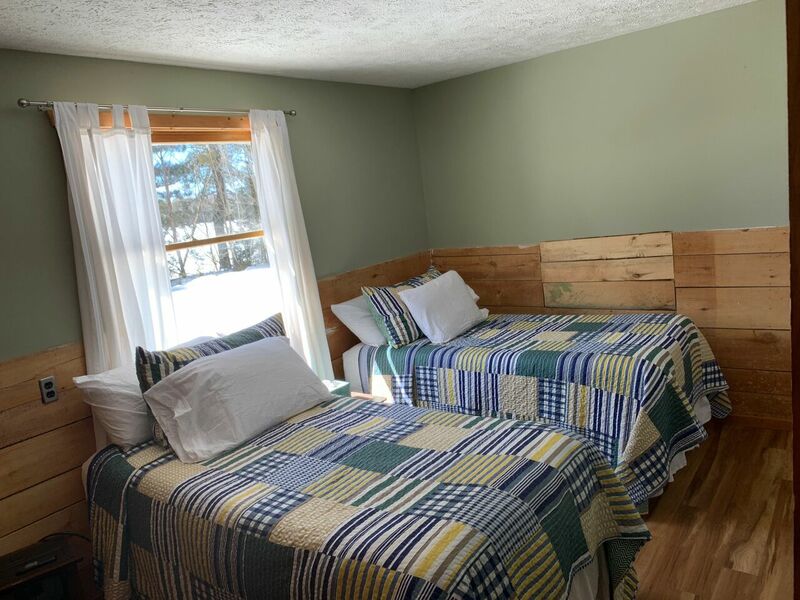 Both bedrooms with twin beds can be converted to kings for your convenience.Just let the office know when you book, so we can have the beds converted upon your arrival. So, grab the dog, and come and enjoy East Lake! With gorgeous sunsets resting on the pleasant all-sports lake, you will create memories to cherish! ATV's: Allowed on property. Trails are nearby. Check out the Newberry trails here! Bathroom #2 (West side of kitchen) Shower & toilet behind a small saloon door. New sink and mirror is across from the washer/dryer. 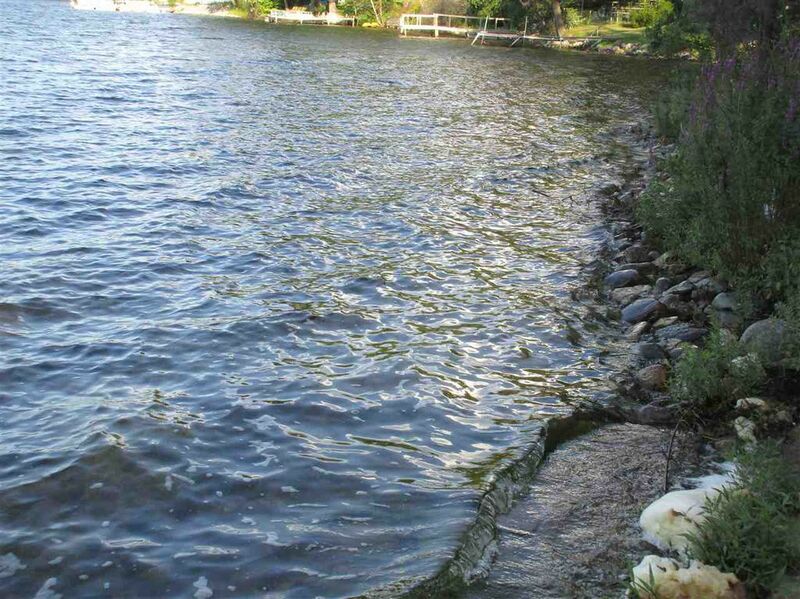 Beach/Swimming: You are able to swim off the dock or along the rocky shoreline. Water shoes might be a good idea for some. Lake is a murky bottom as of right now. Cable/Satellite TVs: YES! Satellite- We have Directv! Cell phone service: You MUST use wi-fi calling. Most phones have no service here. There is a land-line at the home. Dock: 30ft. private dock for your use. So, feel free to bring your own water vessel and park it at the dock. 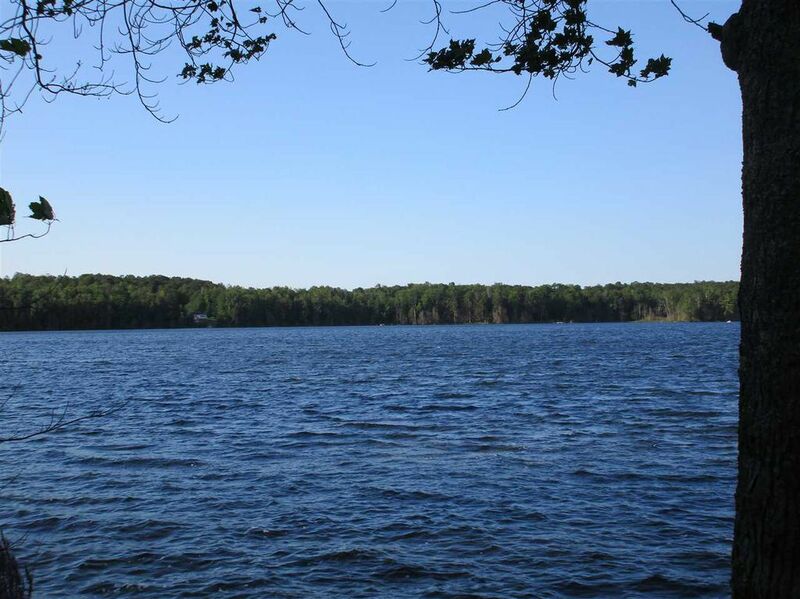 There is a primitive boat ramp approximately 100 yards from the property for you to launch your boat. Grill: Propane grill. Propane will be provided for guests. Grocery Store: 500 ft. to a convenience store- Bear Den is along MI-28. 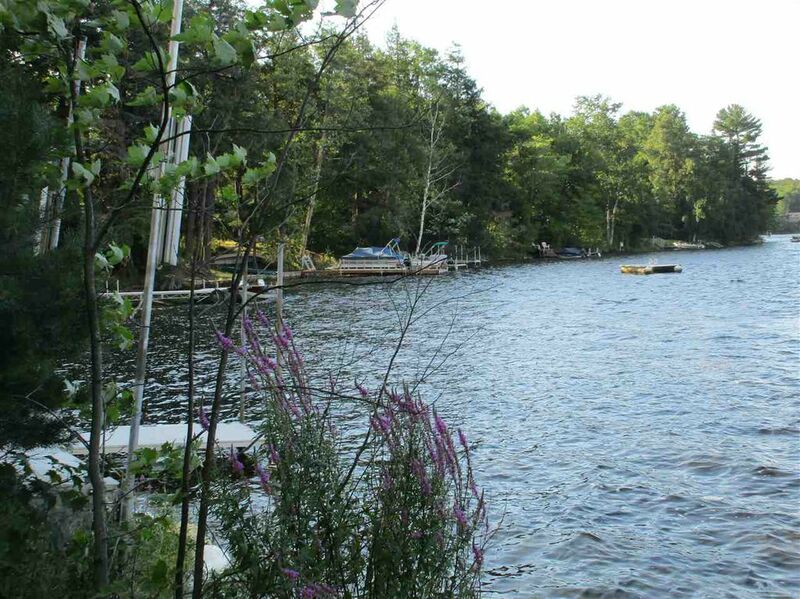 Privacy: There are other waterfront homes through the trees, yet you can't easily see them. Snowmobiles: We do allow snowmobiles.You can ride directly from the house to the nearby trails. Plenty of parking-we even have a a space in the garage you can use to park your snowmobiles. Upon request we do have a clear detailed map of the nearby trails. Washer and dryer: YES! 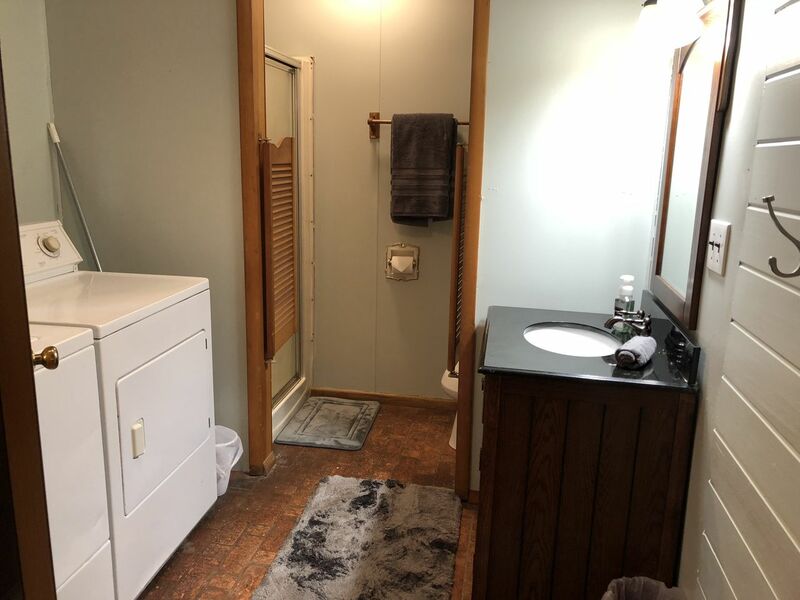 An older washer-dryer is located in the 2nd bathroom, off the kitchen. Laundry detergent is provided. We enjoyed the house very much. A couple odd quirks with the electric, a lamp that constantly went off & on and a light in the kitchen that did the same. We told them so they could have it looked in to. Great having the use of the washer and dryer too! So much space here and we enjoyed that, plus the use of the garage for the snowmobiles was awesome! We got about 5-6 inches of snow one night ant they were right there that day to plow the driveway! The trails were a bit more difficult to get to then we thought they would be, and we had to go on the roads quite a bit, but luckily there was plenty of snow to do so! Bonus - a gas station just across the street! Overall, we had a great week at the Stone Cottage! Thank You! Richard, you are most welcome! We love when our guests appreciate our properties as much as we do, and you certainly had good snowmobiling conditions. We hope to see you back again soon. We enjoyed our stay! It was so nice that the house was furnished with paper goods, laundry detergent and hand soaps at all the sinks! It was nice to have the garage use for our snowmobiles also! One thing we noticed was the flickering of a few of the lights. We had one go off and on at random in the living room. Thank you! Richard, thanks for the compliments on Stone House. 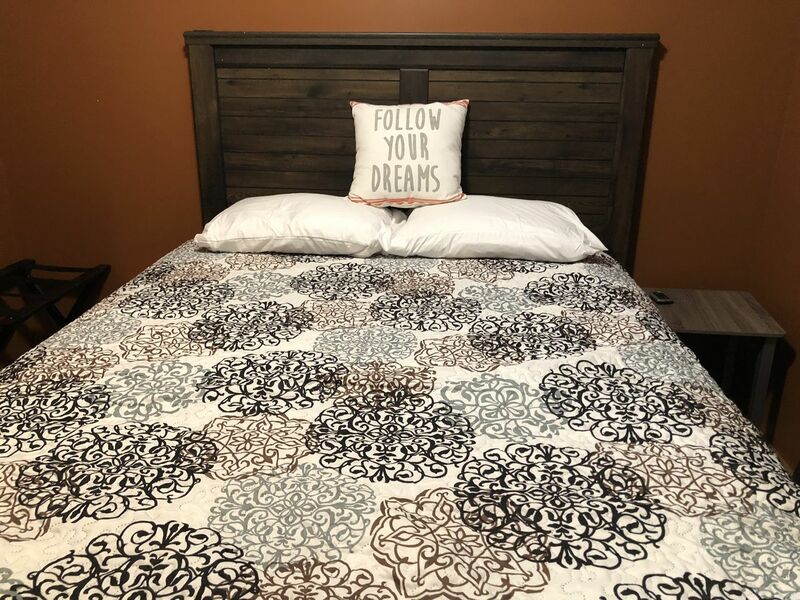 We make every attempt to be sure that our guests are as comfortable as possible. We'll be certain to check on the flickering lights. Thanks for letting us know about it, adn we hope to work with you again soon. Wonderful large home. Accommodated our large group very well! We had a great time snowmobiling. Bonnie and Bruce, we are so happy that you enjoyed staying at Stone House. The U.P. is extraordinary in winter, and the Stone House is a lovely and comfortable property. See hope to see you again! 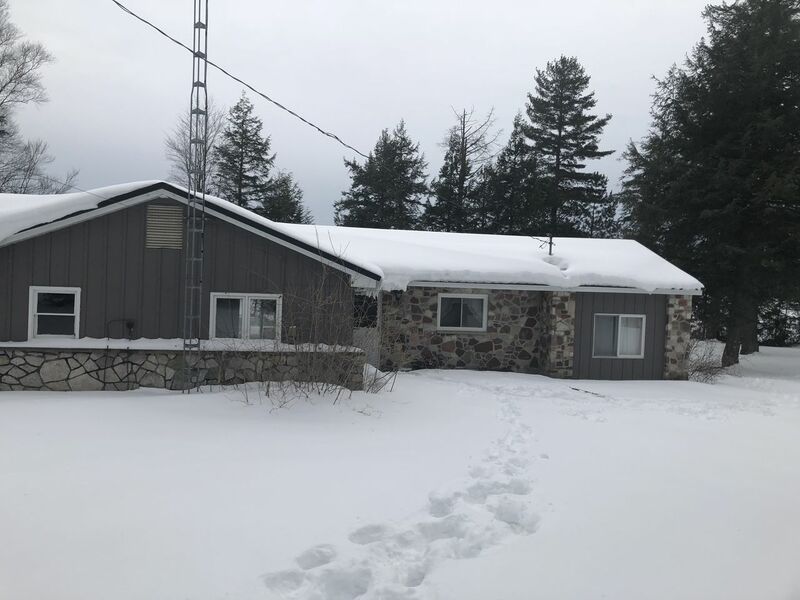 Richard, we are so happy that you enjoyed Stone House and got some good snowmobiling in! It is such a great property for winter vacations. We hope to see you back again. Great location for what we looking for. Nice and cozy but large enough to accommodate a large group. Paula, the Stone House is a great location, and we are so happy that you enjoyed staying there. The U.P. is so spectacular in winter, and having a cozy place to stay makes it all the better. We hope to see you again. Doug and Sarah, we are so happy that the Stone House was a sanctuary for you. That's what we like to hear! It is a great location for sightseeing in the UP. We hope to work with you again. The house is in an amazing location. 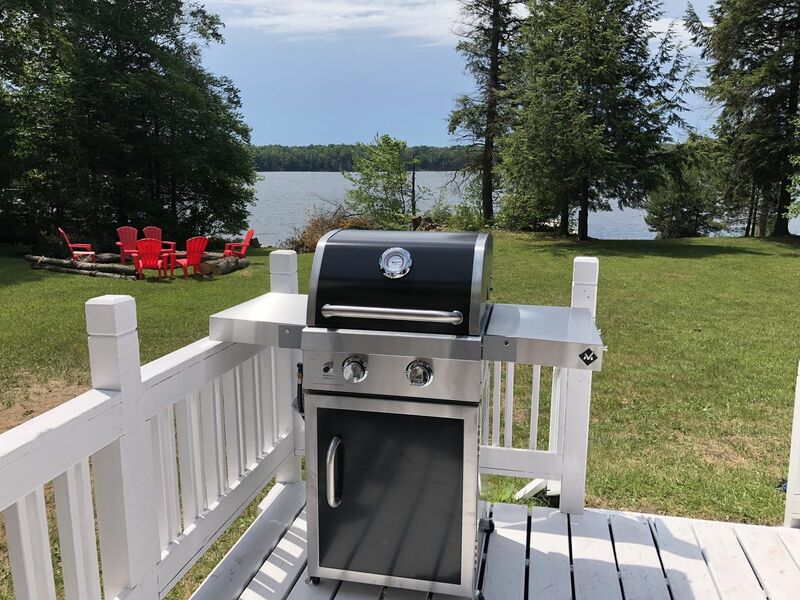 Perfect for enjoying the outdoors and some privacy to have a fire by the lake. The pontoon boat was really enjoyable we watched otters swimming at night from the boat. There is a back deck to enjoy your morning coffee. 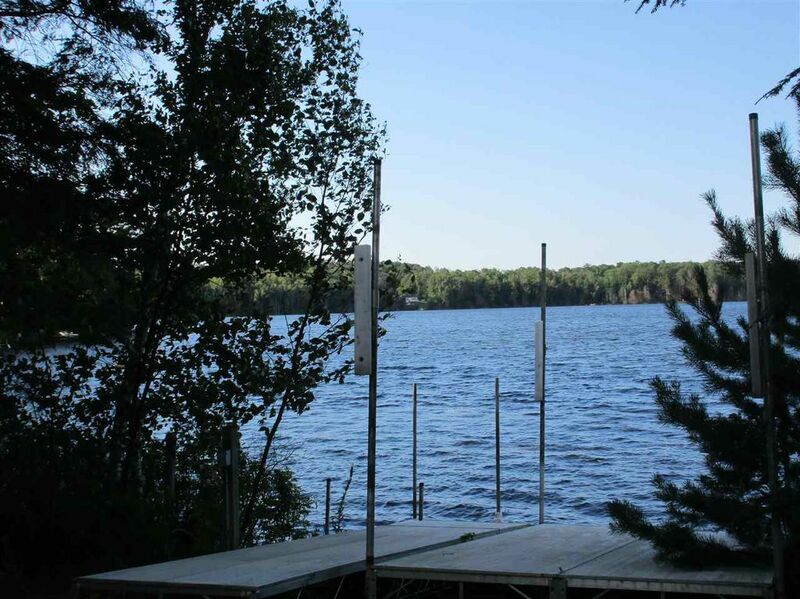 One morning while sitting out there we spotted bald eagles flying right above our dock! The house fit all 7 of us comfortably and the beds were very comfy. Everything was clean and arranged. It is a little rough in a few spots but just.looked like a work in progress. We all enjoyed being there thoroughly and look forward to returning. Misty, we are so happy that the Stone House fits your needs so well. It is a great location, and seeing the bald eagles and the otters must have simply been joyful! We look forward to having you as our guests again in the near future. 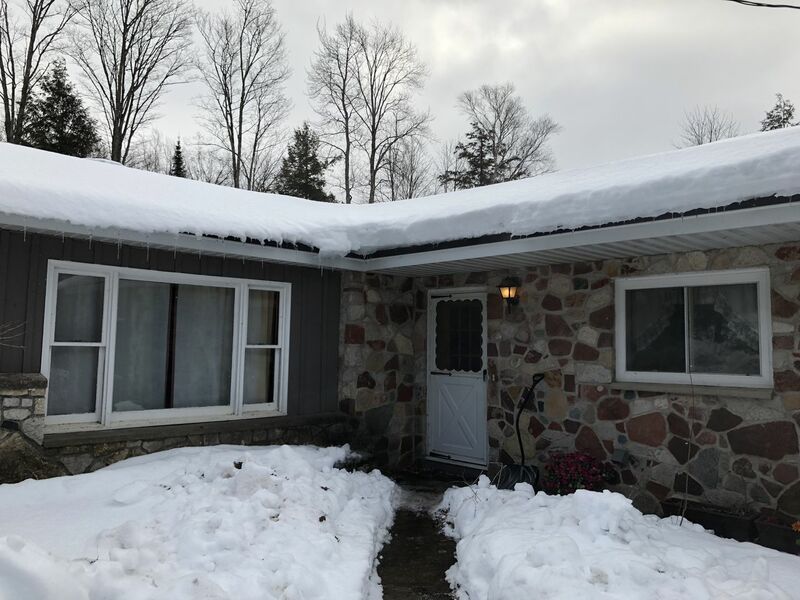 Great location in the UP! Stone cottage was a great place to stay and the location was beautiful. Plenty of room in the house for a big group. Did a lot of sightseeing and also enjoyed some fishing and cruising on the lake. A few improvements could be made, but overall, we enjoyed our time and were happy that we could bring our doggie with us! Chris, we're so happy that you and your pup enjoyed the Stone House. It's location is perfect for sightseeing, and there is so much to see! We look forward to working with you again soon. A Serene Sanctuary Ideal for Day Trips to All the Upper Penninsula Has to Offer! From the moment we crossed the threshold of this beautiful cottage, a sense of serenity flooded over me. We’d been captivated and sidetracked by exploring along our way to the cottage, and so although our arrival happened late into the night, the caretaker had seen to it that there were lights on and gentle breezes coming through the open windows to greet us. 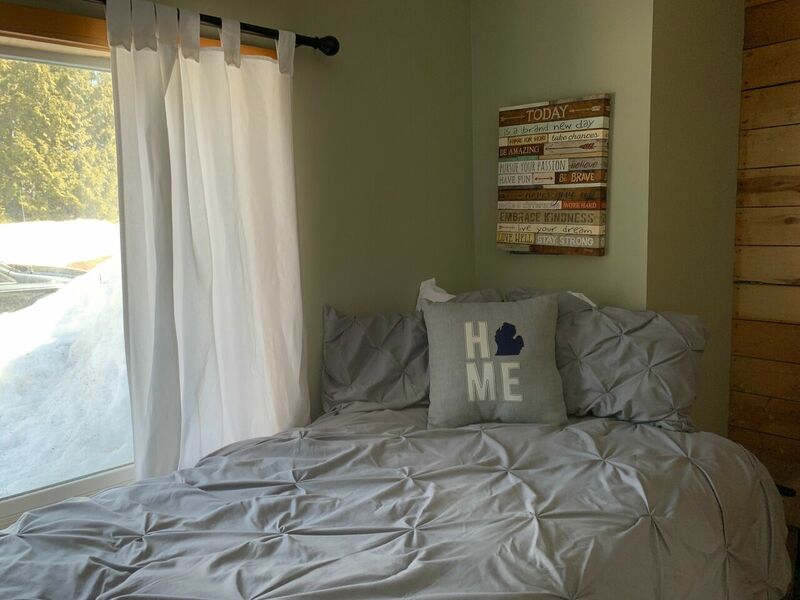 The present owners have filled the home with decor that is a mixture of affirmations and homage to "The Mitten", and I hope they will continue to develop these themes as they endeavor to add their own thoughtful touches to this home. 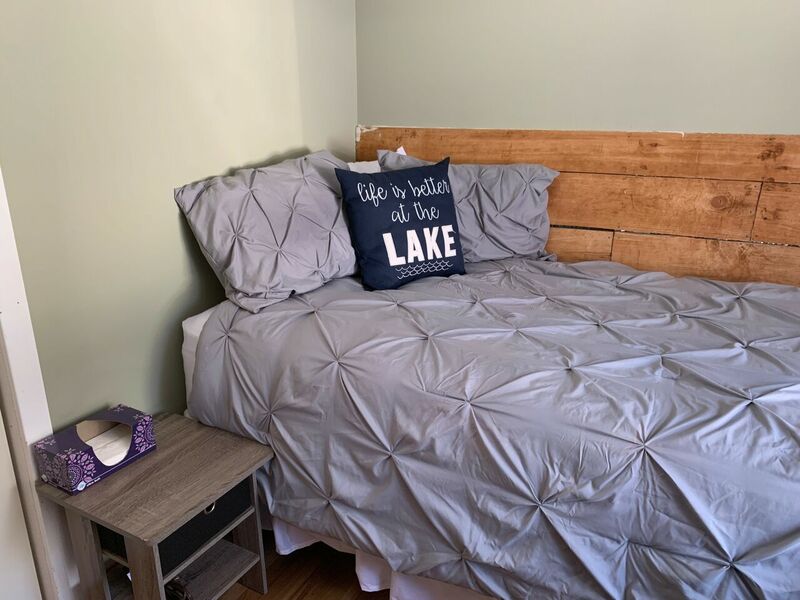 Everything from the sign boards to the bath mats is intentional and well placed - classic Mitten signage reminded of just how close we were to all the best that the Upper Penninsula has to offer, and I was eager to take it all in. However, I could almost feel the owners encouraging us to replenish, re-center, and enjoy - all at a slow and luxurious pace. All the subtle touches were like an invitation to entertain a sense of adventure, but all sentiments were tinged with the permission to indulge. 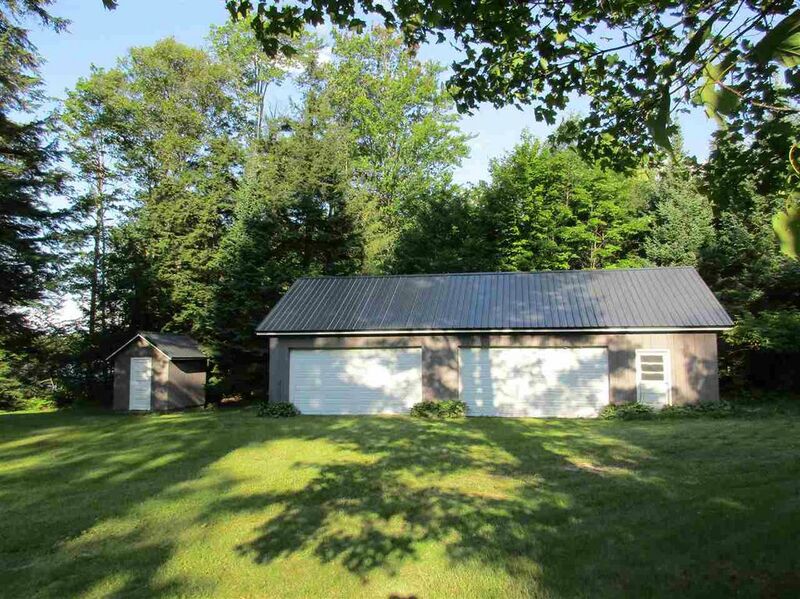 Don't let the name "cottage" fool you into thinking this space is the cramped, rustic structure of yester-year! Even our large family had plenty of room to spread out, with enough charmingly decorated bedrooms for adults, teens, and small children to have privacy - we even wished we'd invited a few friends along to take advantage of all the space! The closet off the master bedroom was the same size as a bedroom two of my children share at home, and they immediately began bartering to see who could claim the space until my husband and I ushered them to their own rooms where they squealed with delight. Our king-sized bed did prove a great space for the entire family to enjoy a lazy, weeknight movie with minimal elbow jabs, but the cottage gave us the flexibility to spend lots of knit-together family time when we needed it while also affording us the space to enjoy some solitude in some of our favorite pursuits. 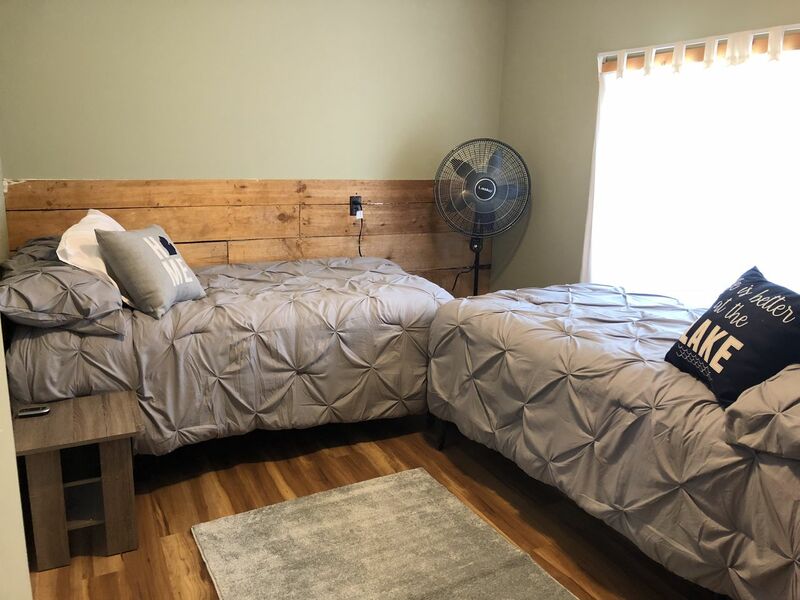 While each room came equipped with a large fan as well as ceiling fans to add comfort, we preferred the tranquil breezes from the lake – what a break from the stifling humidity we’d experienced in our Southeast Michigan home!! We felt like we pleasantly fluctuated between the best of two worlds – on one hand, we embraced all the outdoors had to offer – exploring in the rowboat, attempting to identify birds, wading, staring up at the vastness of a sky heavy with starlight while we cooked smores, and allowing our children to play with abandon. On the other hand, we relished the luxury of escaping into comfort and convenience of what one of our children called “the fancy cottage”. 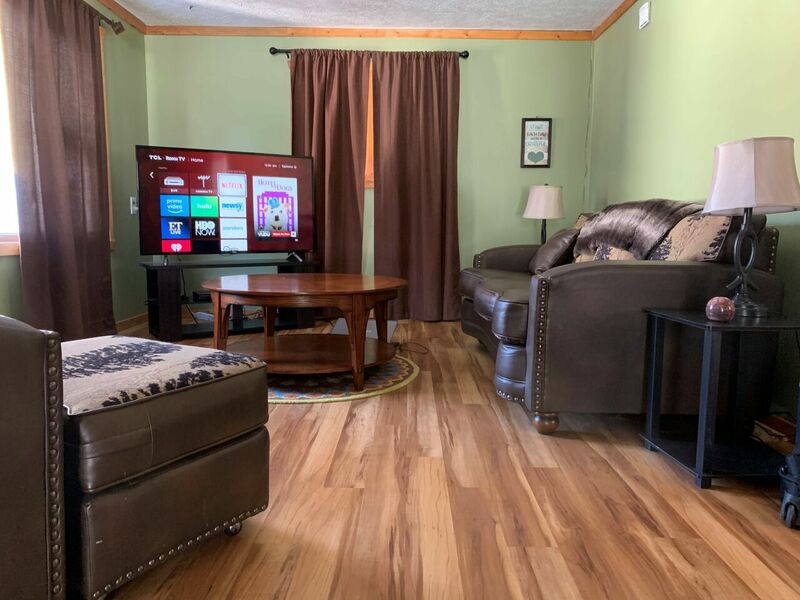 We were impressed by the new wood flooring, and all the modern amenities – consistent wi-fi service meant we could catch up on work while gazing out at the lake and then unplug in time to go fishing. We loved returning from playing in the waterfalls and having the option to sink into classic leather furniture, close the drapes and put our feet up to catch up on an on-demand movie, or to draw the curtains and breathe in a glimpse of the sunlight filtering through the trees that separate the property from the road. 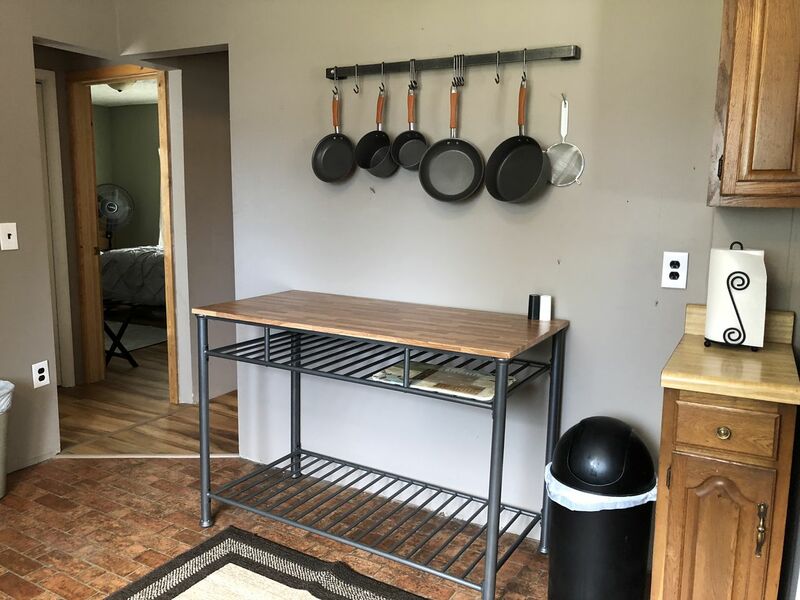 Two of my own small kitchen would fit into this one spacious one, with ample supplies and counter space for creating a full meal or merely reheating leftovers in the microwave. 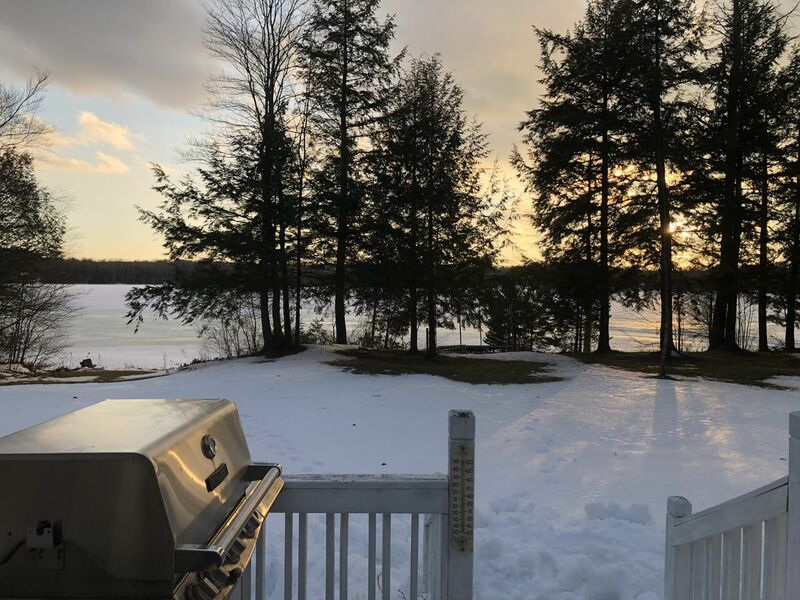 I found myself handwashing the dishes instead of using the dishwasher because I wanted to linger over the view from a window that looked out over the uptopia of a yard encircled by trees and the peaceful lake. The dining room had an abundance of natural light, and it was a treat to pause and eat around a table versus rushing out the door. I was pleased that in this home, we had plenty of dining space and could have even spread out to stools at the kitchen counters had we entertained guests – we have often stayed at vacation homes that have sleeping accommodations for many, but table space for only a few. The grill, the camp chairs, the yard furniture – all of it lent itself to entertaining or just stretching out a simple meal. 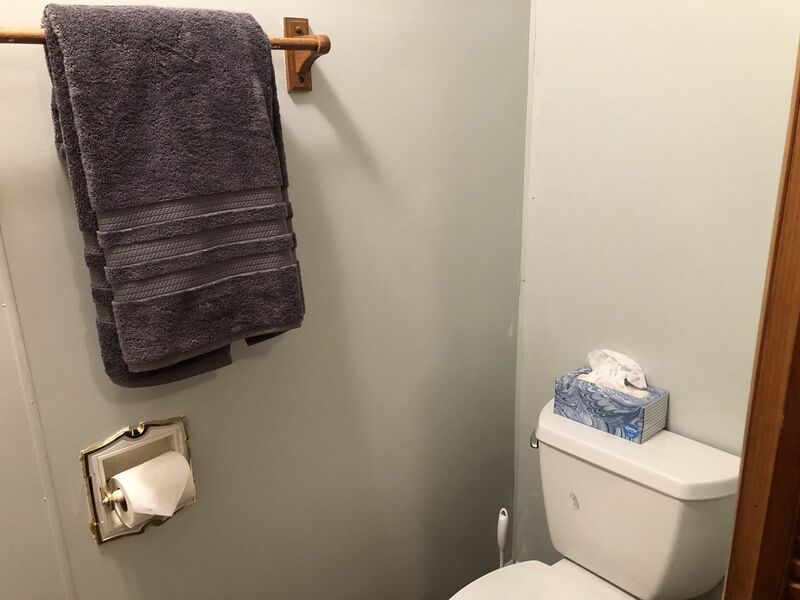 Having the convenience of two bathrooms was definitely a plus – one boasts laundry facilities so that when our children splashed, knee-deep chasing frogs, collecting shells, or attempting to scoop minnows with their nets, we were able to grant them permission without apprehension. Two showers and a large tub also meant we could accommodate our crew of bathers of all ages, and there were no long lines or fussy children! As much as we relished shutting ourselves away from the rest of the world, we rested in knowing that we were just moments from quaint Newberry where we could stock up on supplies or fit in some window shopping. When we were in a real pinch for gas, firewood, or another quick necessity, a quick walk to the Bear Den would prove fruitful – this camp store disguised as a convenience store/gas station boasts a full ice cream counter, homemade doughnuts in a warmer, and old fashioned, friendly service. I also feel that it bears mentioning that the caretaker endeared us even more deeply to the cottage. She checked in on us briefly when we were reading by the water’s edge, and it was clear that not only did she wish for our stay to be enjoyable, she was representing the wishes of her employers as well. 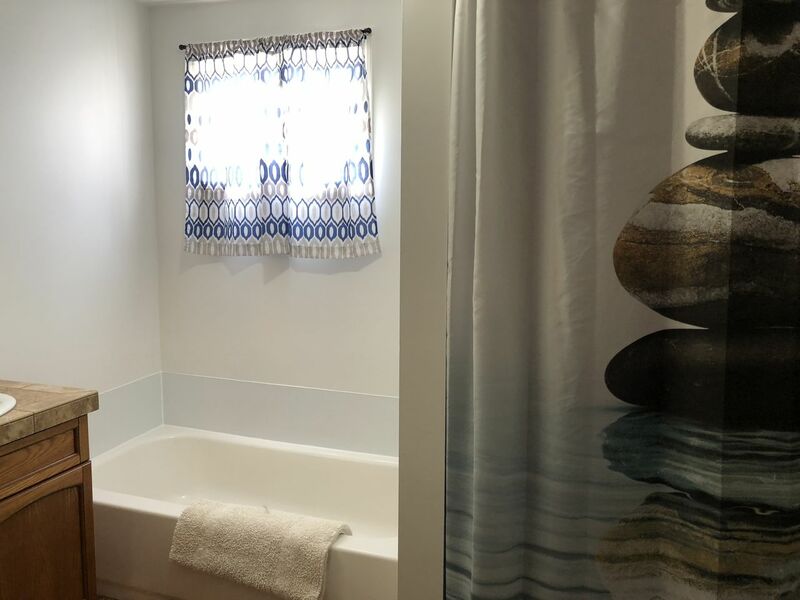 As an ambassador of Freshwater Vacation Rentals, it was clear that she aimed to be as unobtrusive as possible, but that she hoped to serve as a resource should we need any assistance. 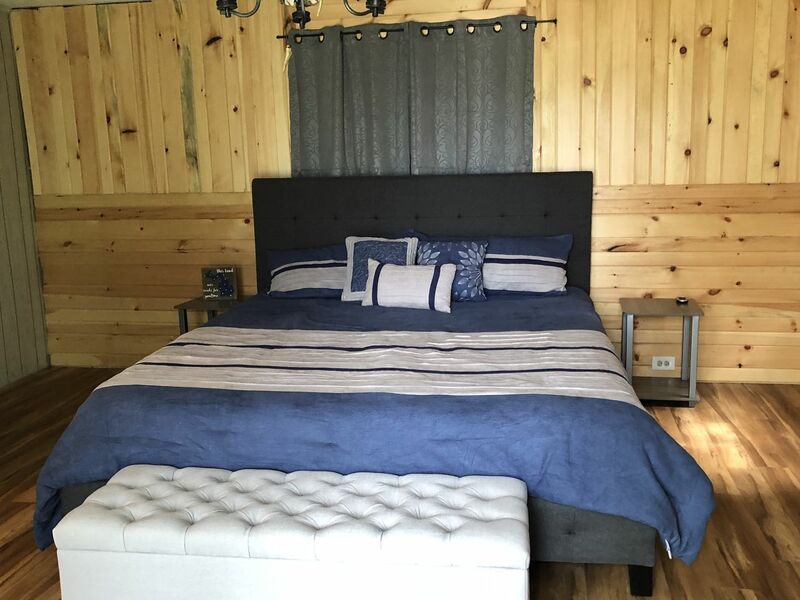 Our experience with Freshwater Vacation Rentals as a whole exemplified superior service from the moment we considered booking until the moment we packed our car and hesitated along the driveway, saddened to have to leave this delightful property. In the past before getting to know this company, we have used other vacation rental services, and have encountered instructions for use that were confusing and contradictory, and have spent valuable vacation time muddling over entryway corkboards with notes scribbled about garbage pick up, cleaning instructions, and other procedures that were somewhat unclear. With Freshwater, the experience was warm and streamlined, with email reminders in the time leading up to the trip, and very clear information about everything from our arrival to how we might want to spend our time during our visit. All of our booking happened so seamlessly that we didn’t require any face to face or phone assistance, but when I did speak with staff about a question regarding a local attraction, they were informative and kind. 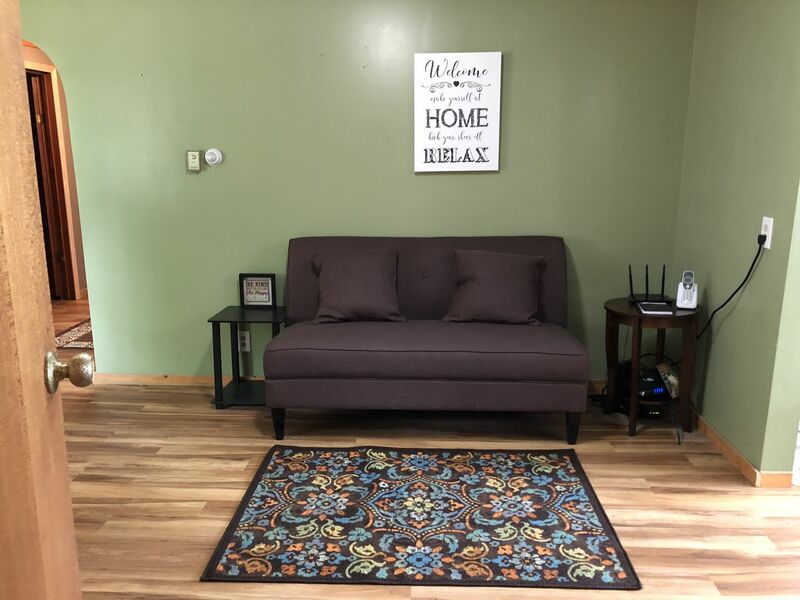 We were confident that, had we had any concerns that needed to be addressed via phone during our visit, we would have received the same thoughtful and warm service that we’ve become accustomed to with this company. 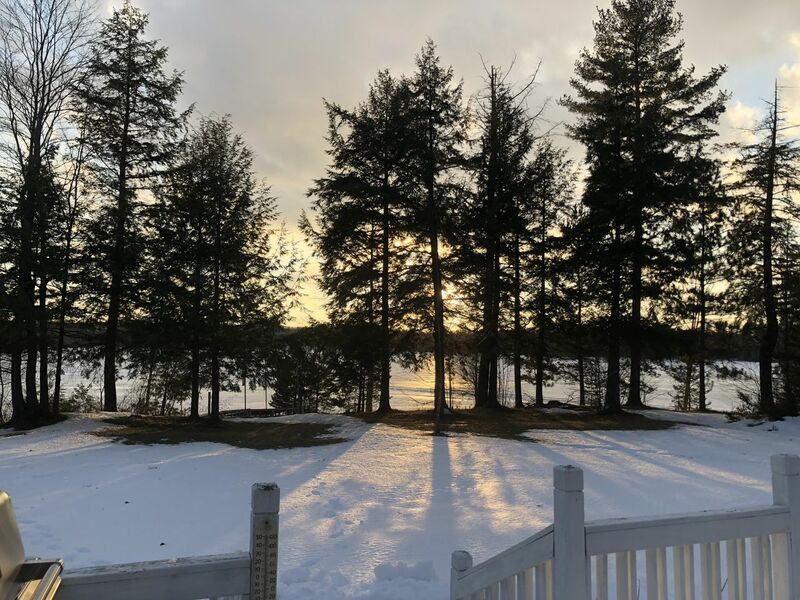 Although we could have never strayed from the property and would have still felt it was a vacation well spent, the location of Stone Cottage truly made it a convenient home base for the Upper Penninsula’s most popular attractions. We found a healthy rhythm of quick excursions like Castle Rock and Oswald’s Bear Ranch and balanced them with the majesty of Tahquemenon Falls and Pictured Rocks National Lake Shore. The more we explored, the more we learned about other places we hoped to someday visit in the Upper Penninsula, so we are eager to return and continue sampling the splendor of the UP, perhaps in time to enjoy that brisk and colorful season of autumn. No matter when we next have the opportunity to breathe in some of that invigorating, fresh air and tranquility that seems to exist in abundance beyond the “Mighty Mac,” we are certain that our travels will take us if not to the Stone Cottage, at least to another endearing refuge we will discover through Freshwater Vacation Rentals! Thank you for allowing us an amazing place to rest our heads and satiate our spirits on this amazing leg of the journey! Our family of four plus our dog had an enjoyable stay at Stone House! It’s a great central location for sight seeing. We enjoyed the lake view and spacious yard. 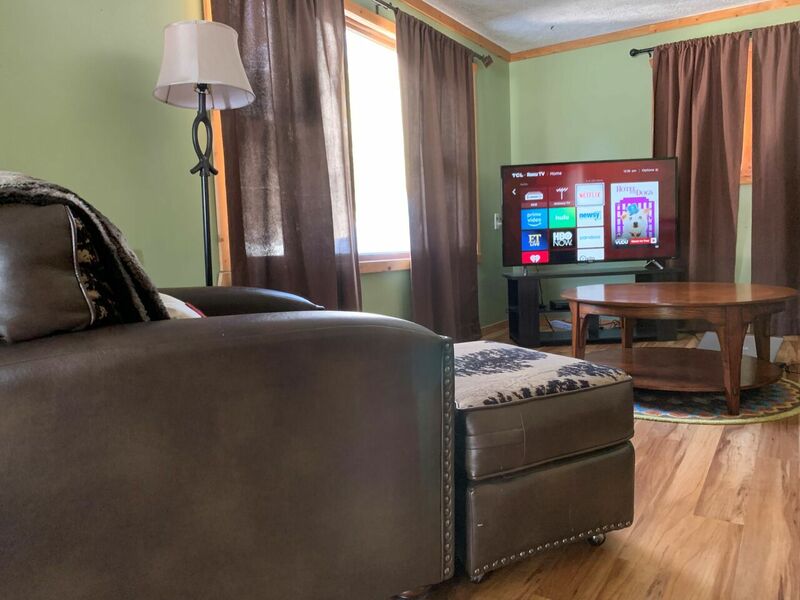 We arrived to a clean house that had everything we could possibly need for a relaxing Upper Peninsula vacation! Kristin, we are so glad that you enjoyed your stay at the Stone House. 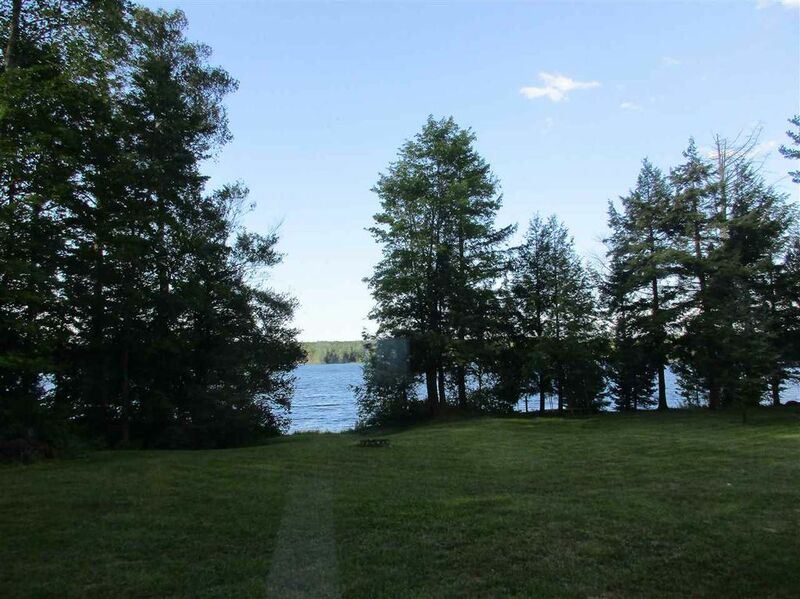 It is the perfect location for seeing the fabulous sites in the UP. Traveling with pups makes the adventure even better! We hope to see you again.